Add lively color to your recreation and food service areas. 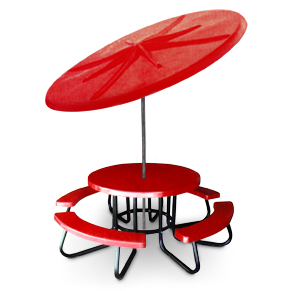 These tables feature an unbeatable combination of beauty and durability. The frames are made of 1-5⁄8" O.D. tube and powder-coated black for durability. The fiberglass tops and seats are coated with Ultragel, 20 mil. thick for longer lasting beauty and durability. 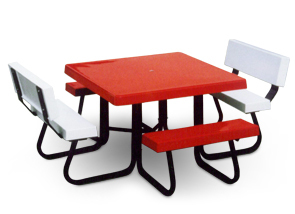 The 48" square table can come with optional backrest consisting of one backrest frame and one plank per seat. Four backseats would be required for all four seats. Fiberglass umbrellas are tough, weather-resistant and come with pole and swivels. They are 7-1/2' in diameter with a 1-1/2" diameter pole. 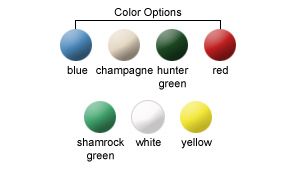 Both tables and umbrella are available in the colors shown. Some assembly required.